Every website or blog for that matter has a separate layout and visual style. A theme presents all your readers with easy navigation which helps them explore your blog better. Blogger.com allows us to tweak, change and install different themes from Design option as show in the image below. WordPress also provides similar features add, activate, edit and delete themes. 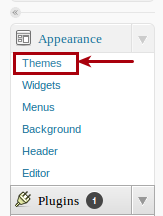 Now we can see all the Themes available in Manage Themes tab. These are Themes are already installed on your WordPress blog. 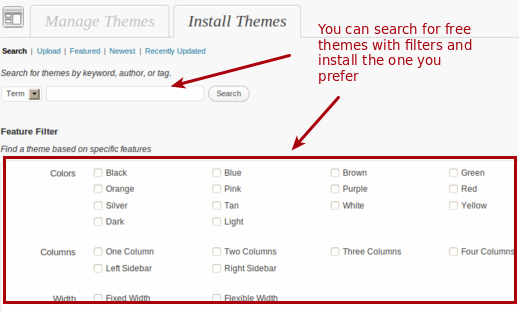 We can also look up free themes on WordPress by clicking on Install Themes tab. Here we get the option to search themes with various features which you find ideal for your blog template. Here is a video of how to go about installing a theme with the latest version of WordPress. We can also edit theme files from the Editor option but it is not desirable to use this editor and usually it is advised that a professional HTML and PHP editor is used. It is better to use FTP.